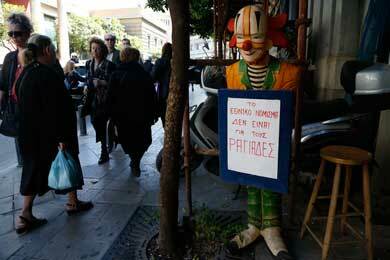 Fear is a sentiment that Greeks have learned to live with over the past couple of years. As the thread by which the country hangs grows ever thinner, fear has begun to pervade all aspects of life. It is so prevalent and has been lingering for so long that most people have become desensitized, blocking from their minds the worst scenarios that could lie ahead. Every now and then, though, there is a jolt to the system that reminds us of how precarious Greece’s situation is and how there are about 11 million people clinging to this fraying thread, hoping that it will somehow repair itself before it snaps and they are cast into the dark valley below. This week, there have been plenty of reminders of just how close the abyss is. Perhaps the most shocking came on Tuesday when during a Skai TV report about drugs shortages, a woman’s cries could be heard from inside a pharmacy. “Where am I going to find my medication?” she screamed with a fear that pierced through the shield of inurement that Greeks drag along with them wherever they go these days. Amid the upheaval unleashed by the near-collapse of the Greek economy and the austerity measures adopted by the government to halt the juggernaut of bankruptcy, it seemed an odd thing to notice as evidence of how the crisis was affecting daily life. But, somehow, the absence of the young woman who usually sat behind the ticket counter at the metro station seemed poignant. It was a reminder that there are faces to go with every cutback, tax increase and structural reform and how catastrophic policies and lousy leadership have led to the fabric of our society gradually unravelling. It’s been a while since the ticket office was vacated – the woman who worked there was probably one of about 300 contract workers on the metro system who did not have their deals renewed in September due to public spending cuts. Since then, passengers have only been able to get tickets from one of the four machines in the station. It struck me as the first clear sign that even the things we have come to appreciate will not remain untouched. The Athens metro was one of the few public services Greece could be proud of but the absence of that face behind the glass felt like a portent that the crisis would soon get its bony fingers around the neck of this pristine network as well as so much else. There have been other telltale signs that the status quo is being buried beneath the ruins of the crumbling Greek economy: The growing number of people looking through dumpsters, the increasing frequency with which Gypsies drive through neighborhoods collecting scrap metal and how traffic jams are briefer, as Athenians think twice about using their cars because the cost of fuel has risen faster than Greece’s bond spread. As people pay more for their gas or basic goods, which have been hit by rises in value-added tax, so they spend less at shops – retail sales were down by almost 12 percent in August compared to last year. This has led to the crisis leaving the visible scar of empty stores in every neighborhood. With the closing down of shops and businesses come redundancies. The most recent figures put unemployment at 12.2 percent, or just over 613,000 people, up a staggering 35 percent since the same time last year. Like the woman from the metro, these are faces now out of the public eye. Instead they can be found in queues at dark unemployment offices or in front of the mesmerizing light of computer screens as they search for jobs. This is a crisis the impact of which can most accurately be measured by what is no longer happening rather than what is, by the people we don’t see rather than the ones we do. At the metro station, soon after the woman in the ticket booth disappeared, one of the four machines stopped working. It has been sitting idle ever since, blinking an error message like Apollo 13 trying to contact a Houston control room that’s just not listening. A few weeks after the first ticket dispenser went into its death spiral, a second machine started rejecting banknotes. Metro staff taped a handwritten “Out of order” notice on it, advising commuters to use the other two machines. Presumably the engineers responsible for looking after these machines are no longer employed or are so few they can’t keep up. With the government looking to save 850 million euros a month from public enterprises next year, this is the new reality we have to get used to. But the lack of maintenance means that soon none of the machines will be working. It will be impossible to buy a ticket to travel, the system will disintegrate. What happens underground will be replicated above the surface. In the headlong rush to cut, scrimp and save without a thought for supporting or strengthening, things will fall apart. That is the moment when the last chapter of this crisis will be written: When all the people who have been cheated, betrayed and mangled by the system step into the breach to reorder things. We are not there yet. For the moment, there is an eerie silence on the streets. After a flurry of public protests at the beginning of the year, the situation appears surprisingly calm – by Greek standards at least. To some extent this can be attributed to three bank employees being killed in May when a bank in central Athens was firebombed during a rally. But there is something more than that. 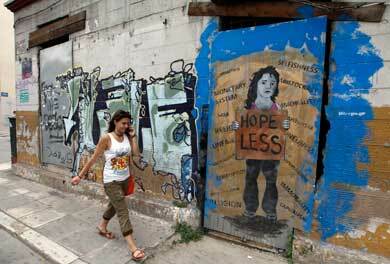 There is a feeling of numbness that has seeped into Greece since the beginning of the year. The numbness that comes from realizing that events have caught you unprepared, the numbness of stepping into the unknown and the numbness of fearing for your future. Most of all, though, it is the numbness of seeing things around you being dismantled while you’re powerless to prevent it. This is what has stopped people from raging against feckless leaders, callous bosses and incompetent unionists. This silence, though, is deafening. It means that anger is building up. If you listen closely, you can hear the whisperings of a gathering storm. This isn’t something that’s happening in the streets or at the squares — it’s taking place in homes, where families are struggling to make ends meet and can no longer feed themselves on the broken promises of the past, it’s happening at cafes where friends meet while dreading they’ll hear more bad news rather than share in some good, and it’s happening in workplaces, where colleagues encounter empty desks rather than the people with whom they shared most of their daily lives. As we prepare for a new year, when more sacrifices will be made – some fair, others particularly harsh – the clock will not just be ticking for the government, desperate to meet the targets it has been set by the European Union and the International Monetary Fund. Time will also be counting down for the people who feel genuinely wronged by what is going on around them: those who are prepared to pay their share but are not prepared to pay for the failures of others. And, when the moment arrives, we will see again the faces of those who had disappeared and remember the pieces of our lives that were chipped away. Then, we will be spurred on to build things again, only this time fairer, stronger, better. 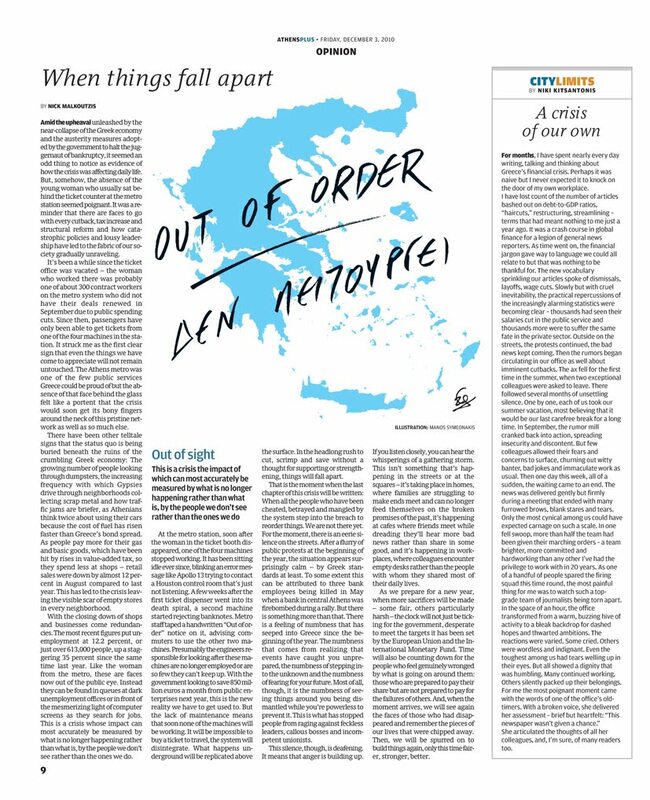 This commentary was written by Nick Malkoutzis and was published in Athens Plus on December 3, 2010.